Data analysis is critical to manage HR operations successfully. Unfortunately, having to go through it all quickly becomes time consuming, especially when there is no proper visualization. Not only does data visualization help managers consume large amounts of data at a glance, but it also helps paint a clearer picture of an individual employee’s performance or personal information. Here are a few ideas of what your organization can visualize for better HR controlling and reporting. We’ve also included some suggestions on how it can be done with the help of our org charting tool Ingentis org.manager. Demographics are an integral part of company level key figures. For example, Google releases an annual diversity report that breaks down demographics for the company globally as a whole, by tech-based roles, by non-tech-based roles, and by leadership. While your company may not be as large or globally reaching as Google, it is still beneficial to track and visualize demographic data points, so you can monitor the development of your company and benchmark how you are doing. For instance, tracking and analyzing the gender, race, and age of your workforce throughout your company, by specific role and by level can help you better understand your hiring and attrition patterns. For instance, if you are working towards a more diverse workplace, you can see what strides you are making year over year. 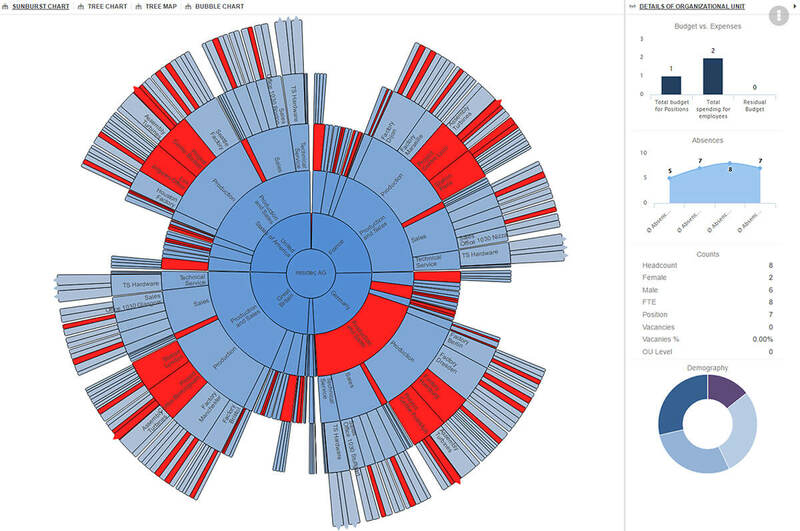 A very popular way with our customers to display large data sets like these is the Ingentis org.manager feature “Big Data Visualization”. The feature works with different charts and maps to give a clear overview of big data. For example, the sunburst chart holds the highest organizational level in its center. The next level is illustrated as yet another circle enveloping the first, and so on. One circle can consist of several fractions, if the respective level is composed of several org units. With the help of visualization rules the circles and fractions can be highlighted by color-coding, to point out a certain circumstance, e.g. to show all those org units with an average age higher than 50. On the division, department or team level, other data may be of interest. Typical indicators that can be illustrated as eye catchers are headcount, number of open positions, budget spent, span of control or full-time equivalent. One idea for the visualization would be to display the KPIs within the org chart as part of the respective org unit. By the way, this feature is also available in our cloud solution orginio. Another possibility is to work with a dashboard view as you may already know it from other applications. Finally, there’s the employee, the individual, with yet another set of important data to keep track of. This could include absences and salaries as well as the evaluation of skills and performance. By visualizing these indicators, managers and HR can quickly see areas where the employee is excelling and areas where they potentially need help. Similarly, by tracking absences – either by sick day or paid time off – you can find trends that allow you to better plan for the future. For example, if there is a certain time of the year many employees take vacations, you can plan ahead to avoid being short-staffed. Compensation is another individual employee metric that you can track and visualize. By looking at compensation trends over time (salary, bonuses, etc.) and comparing to data from employees in the same or similar role as well as industry data, you can ensure that you are offering competitive compensation for your employees and strengthen your chances of retaining them. As the visualization of this information can turn out to be pretty detailed, our suggestion is to work with a tooltip – a dialog box that appears when your cursor hovers over a certain employee and contains the suggested or other KPIs. So, these are just a few ideas of how to stay on top of your HR data. Maybe while reading you’ve come up with other data units you’d like to visualize for your company. If you’d like to learn more about how Ingentis org.manager can improve HR controlling for you, have a look at the org.manager product page, or contact us directly via mail@ingentis.com.